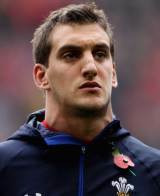 Flanker Sam Warburton is one of the new stars of the international game having emerged as a world-class talent with a string of eye-catching displays for Wales. He was picked for the Wales squad less than a year after his Cardiff Blues debut and made his Test debut as a replacement against the USA on that summer's tour. In 2010 he ousted Williams from the openside berth at Test level and continued his strong form into the Six Nations. As Wales stepped up their Rugby World Cup preparations he came to the fore, captaining his country for the first time in a loss to the Barbarians in Cardiff before taking the armband in back-to-back Tests against England. The second, a 19-9 win at the Millennium Stadium, saw Warburton named Man of the Match. He captained Wales at the 2011 World Cup, the youngest player to do so, and was a key figure in their outstanding run to the semi-finals. However, Warburton saw his tournament end on a sour note with a red card in the 17th minute of their defeat to France for a dangerous tackle on Vincent Clerc and missed the third-place play-off. He returned to lead Wales against the Wallabies in an-end-of-year international at the Millennium Stadium and was named the Rugby Union Writers' Club personality of the year. He struggled with injury throughout the 2012 Six Nations campaign but was still a key figure in their run to an historic Grand Slam which was clinched with victory over France in Cardiff. The hangover from a superb 12 months hit home as Wales lost a string of matches and Warburton found himself struggling to hold his place. He was sidelined with injury and when he returned it was not as captain although it was as Wales clinched the Six Nations with a run of four wins. His year then improved further still as Warren Gatland named him captain for the Lions tour to Australia and in doing so he became the first Welsh Lions captain since Phil Bennett in 1977. Warburton made a slow start to the tour but hit form in time for the Tests with Australia, impressing in particular in the second test. However injury ruled him out of the final Test in Sydney as the Lions wrapped up a 2-1 series victory with the Welshman becoming the first tour captain to taste victory since Martin Johnson in 1997.